My first week of classes is now done so I can begin to describe the University of Malta. The differences between UofM and Canadian schools are mostly physical. Keep in mind that I've come from NSCADU (Halifax, Canada), which is different from most Canadian schools anyway, so this isn't a entirely fair comparison. The campus at UofM looks like everything else in Malta. 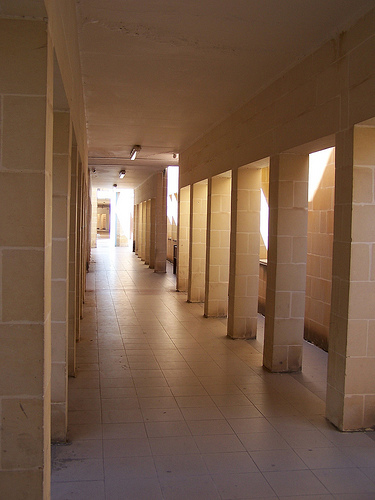 It's made of limestone and interestingly, most of the hallways are outside. Not just hallways between buildings, but also hallways you might find offices in. The campus is small with a lot of buildings all over it. There are some gardens but no large expanses of lawn like you might find at DAL or SMU (Halifax, Canada). All of my classes are in the Faculty for the Built Environment building (the architecture building) which is planned out like a circus maze. The classrooms and classes are also small. There is an average of 15-30 people in my classes, with an even split between male and female students in most. There are also a lot of "mature" students in my classes, and seniors who sit in on lectures. I'm assuming this is because University is free for all to attend here. As for my classes they have been challenging so far. It is an adjustment getting used to a new accent and vocabulary and a new type of workload (independent readings vs. tests or papers). My profs have been great. Since Malta is a small country with a rich history of art my profs are doing a lot of exciting and innovative research in the area. Some of them have literally written the book(s) on Maltese art history. Art history in places like Italy has been examined and written about forever. Given its size, and fairly enough, there is obviously not as much research and writing on Maltese art. It is very interesting to be in the presence of lecturers who are doing that research and writing right now. It does rain in Malta. We are definitely entering the rainy season with clouds in the forecast for the next week. Like in the Caribbean, storms come quick and fierce and blow out in a couple of hours. After the rain passed we went into Valletta to buy textbooks and window shop. Then we went down to the Valletta waterfront to eat dinner. For anyone we were in Malta with in 2008 - we went to the new Brown's restaurant which was pretty hilarious. The food was mediocre but we wanted Browns to be the first place we went out to eat at. And yes, there were vodka redbulls on the dinner drinks menu. The Valletta waterfront is on the opposite side of the peninsula from Sliema and Marsamxett harbour (the bit we can see from our terrace) and faces the "Three Cities" of Birgu/Vittoriosa, Senglea and Cospicua. After dinner we took a bus to Birgu (pronounced beer-goo) for Birgu Fest. Birgu Fest is like a Maltese festa, but without the religious pomp and ceremony. It celebrates the historical importance of Birgu (as a foritifed city and military stronghold...or something...) by hosting a three day party with Maltese food, drinks, music, historical reenactments, free or reduced entrance to museums, and all night entertainment. Last night the city of Birgu also attempted to break the world record for most candles lit at once by cutting the power to the city and using only candles to light up the night's festivities. There were an estimated 15,000 candles all over Birgu - it was really spectacular. They aren't very worried about fire safety. It's all built from rock anyway, right? We took pictures throughout the night but it really couldn't do it justice. Imagine being in a 1,000+ year old Mediterranean city with thousands of candles all around and about 30-40,000 people roaming the streets. It was kind of magic. We are now totally primed for the rest of the Maltese festas, which tend to happen in the summer, with the exception of Carnival and St Paul's shipwreck in February/March. Like we said, the dogs are adjusting nicely. After being quarantined, getting sick for a week because we switched her food, and injuring her back (all better now!) Ellie has found her happy place. And Winnie has found a place under a bed where she can hide during storms. "That thing definitely isn't light"